Christopher Wren, the son of the Dean of Windsor, and nephew of Dr. Mathew Wren, the Bishop of Norwich, was born in 1632. As his father was the king's chaplain, Christopher spent his early life in Windsor Castle. As a child he played with the king's son who later became Charles II. Christopher was an intelligent boy and did very well at school. He was particularly interested in mathematics and science, and by the age of seventeen had made several inventions. These included an instrument that wrote in the dark, a weather clock, a pneumatic engine and a new deaf and dumb language. At Oxford University Wren developed a reputation as a brilliant scientist. He carried out a series of experiments that was to prove very important for health care. For example, he showed how it was possible to send people into a deep sleep by injecting them with opium. This helped doctors who wanted to carry out long operations. Wren himself used this system to remove a spleen from a dog. He also successfully used a syringe to transfer blood from one dog to another. In 1657 Wren was appointed as professor of astronomy at Gresham College in London. Wren became interested in the laws of motion. He carried out several experiments on this subject, and when Isaac Newton developed the theory of gravity he was quick to point out that he owed a great deal to the work of Wren. Wren joined a group of mathematicians, scientists and scholars that met to discuss new ideas and in 1662 Charles II granted them a charter to establish the Royal Society of London for Promoting Natural Knowledge. When Wren was a student, Christopher Wren read a book entitled On Architecture. The book had been written by a Roman architect called Vitruvius in the first century AD. After reading On Architecture, Wren developed a desire to design buildings similar to those built by the Romans. In 1663 Wren visited Rome and was particularly impressed with the Theatre of Marcellus. Although the theatre was in ruins, Wren was able to inspect drawings that revealed what the theatre looked like when it was first built. When Wren was later asked to design a new theatre in Oxford, he decided to use the information that he had gained when studying the Theatre of Marcellus in Rome. On 2nd September, 1666, the Great Fire of London destroyed a large area of the city. Charles II had to appoint someone to take charge of rebuilding London. After much thought the king gave the job to his childhood friend, Christopher Wren. This included the task of building over fifty new churches in London. Wren was also commissioned to design and build St. Paul's Cathedral. St. Paul's took thirty-five years to build. The most dramatic aspect of St. Paul's was its great dome. It was the second largest dome ever built (the largest was St. Peter's Basilica in Rome). Both domes were based on the one in the Pantheon built by the ancient Romans. Wren was sixty-six years old when he finished St. Paul's. Other buildings designed by Wren included the Royal Exchange, College of Physicians, Chelsea Hospital, the Royal Naval College, Custom House and the Drury Lane Theatre. 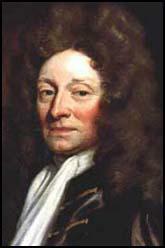 When Christopher Wren died in 1723 he became the first person to be buried in St. Paul's Cathedral.